Did you know that your Grandville dentist may be able to predict heart disease or diabetes during your next teeth cleaning? It is important to understand that your oral health is connected to your overall health, which is why dentists look for bleeding gums, loose teeth, and other signs of more serious health issues. Keep reading to learn what types of medical conditions your dentist can spot. Many patients with heart disease are also diagnosed with gum disease. If you have been diagnosed with periodontal disease, you are at higher risk for gum-borne bacteria being able to enter the bloodstream and flow into your heart. If you have a family history of cardiovascular disease, you’ll want to let your dentist know so they can better monitor the condition of your teeth and gums. If you have coronary artery disease, the last thing you need is dental plaque traveling through your arteries. People with diabetes are often vulnerable to infection, which is why they may have gum disease. Gum disease is caused by untreated plaque buildup on your teeth and gums and can develop into the more serious periodontal disease. While gingivitis can be reversed by adopting a healthy oral hygiene routine and having teeth professionally cleaned, periodontitis is a life-long condition. 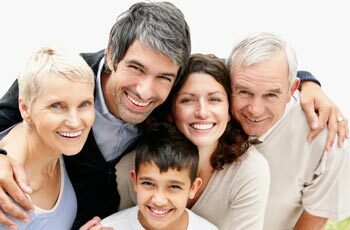 If you have a family history of diabetes, you’ll want to let your dentist know so they can easily spot gum disease symptoms like bleeding gums, receding gums, swollen gums, bad breath, and tooth loss. As we get older, the bones in our body may weaken from what is called osteoporosis. Osteoporosis is a condition that causes your bones to get brittle, which is why many elderly people may break a bone after a slip and fall. Your dentist may be able to spot the signs of osteoporosis in your smile, which includes loose teeth and receding gums caused by tissue loss. The American Cancer Society estimates over 50,000 Americans will get oral or throat cancer by the end of the year. Thankfully, oral cancer screenings are designed to catch oral cancer in its early stages so you have the best chance of survival. You are at higher risk for getting mouth cancer if you have a history of using tobacco products or abusing alcohol, which is why it’s important you fill out an accurate medical history for your dentist. During your routine dental exam, your dentist will be able to do an oral cancer screening and check the inside of your mouth for suspicious patches or lumps. While people with eating disorders are obviously aware of their actions, they may hide their symptoms from family members and medical professionals. Unfortunately, this means that many people with eating disorders don’t get the help they need. During a dentist appointment, a dentist should be able to catch the signs of an eating disorder by the loss of tooth enamel on the insides of front teeth. A person with an eating disorder may also experience sensitive teeth, bleeding gums, and dry mouth. If you recognize any of the above symptoms, you’ll need to schedule an appointment with your dentist or primary care physician as soon as possible. This blog post is in no way meant to substitute seeing a medical professional. Our family dentists at Sarah Palmer DDS are dedicated to helping his patients maintain good oral health and overall health by offering preventative dental services. If you are interested in scheduling a teeth cleaning or dental exam, call our office at (616) 534-0080.